An event with the Baltimore City Black Teacher Recruitment and Retention Working Group about our process and progress. Come hear the issues we've unearthed and how district folks, teachers and other partners have engaged in authentic collaboration to tackle these challenges. Educators! Want to teach your students about Baltimore during the Black Lives Matter week of action? Come learn about this curriculum created by Baltimore City School teachers. There are lessons for elementary, middle, high school and adults. The topics include: Black women, community activism, Black Butterfly and White L, from Africa to Baltimore, and more! All lessons include Common Core State Standards, as well as one or more of the 13 Principles of the Black Lives Matter Movement. The Black Lives Matter Week of Action in Schools is Feb 3-10, 2019. Come to the event to meet the creators of the curriculum and learn how to implement these lesson plans in your own classroom. A panel and discussion about happens when testing data takes priority over authentic accountability. We will explore the history of the accountability movement in schools and explore what authentic accountability could look like in schools. Break out into small groups for discussion. 7:15-8:00. Teachers’ Democracy Project partner to put on an event in conjunction with Black Lives Matter week of action. Join us for a screening and panel discussion about the Decline in Black teachers in Baltimore City Schools. Panel and discussion with local, state and federal officials on how parents can be engaged in schools. This event will focus on understanding teachers unions today and what a union could become. The event will be facilitated by members of the Baltimoree Movement of Rank and File Educators (BMORE) who attended a national conference of Teacher Union Caucuses that are pushing for change in education across the country. 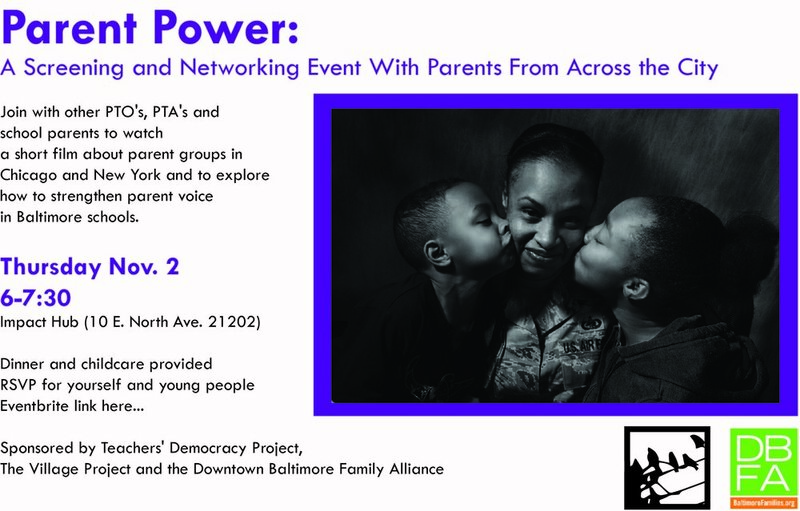 This event will share some of that work nationally and explore a vision for Baltimore. BMORE is a diverse group of educators committed to advancing quality public schools and the labor movement. This is a workshop and discussion for guardians and anyone else who is interested in learning more about helping young people when they need extra support in school. Charvette Barfield- Parent Educator, Parents’ Place of Md. 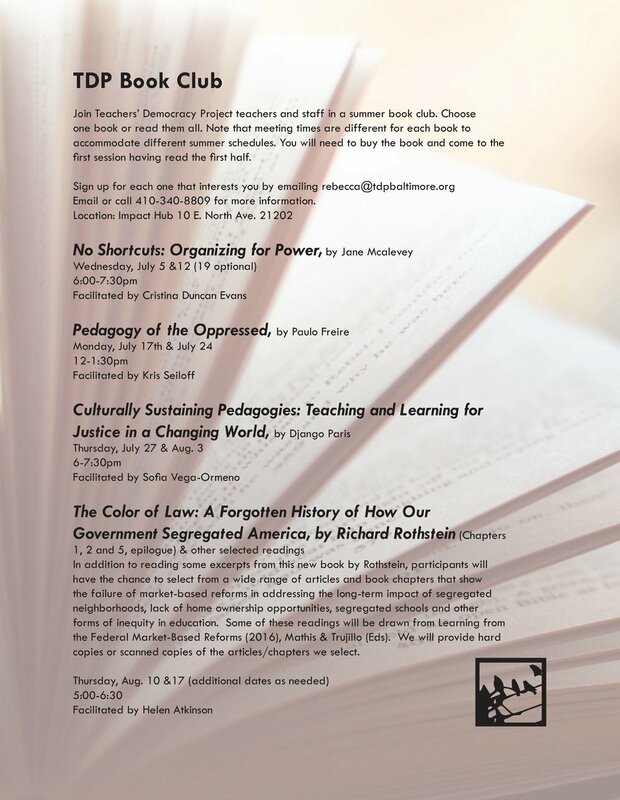 The Teachers’ Democracy Project invites teachers to come together, hear about successful and adaptable curriculum stories from other teachers and get to workshop their own social justice curriculum ideas. For more info email democracyproject@icloud.com or call 410-340-8809. Teachers are encouraged to bring a friend who teaches in the same subject area. This workshop is designed for teachers to learn how to defuse conflict and foster accountability. This easy-to-implement tool helps build positive communication and culture. Snacks will be provided. This training is in partnership with Community Conferencing Center. This workshop is designed for teachers who are new to Restorative Practices or for those who want a refresher. The training will begin with an overview of the process and engage with teachers in problem solving and addressing the challenges of implementation. Snacks will be provided. This training is in partnership with Community Conferencing Center.